The Sundgau’s touristic appeal is closely linked to its history. This territory was once a strategic land owned by the Habsburg Dynasty and coveted by the Kingdom of France. In a way, the Sundgau could be called a Land’s End region of Austria as it marked the most western post of the Vorderösterreich (Anterior Austria). Learning about the Sundgau history also means learning about the relationship between France and Austria from the 14th to the 17th centuries. The illustrious family of the Counts of Ferrette was the first dynasty to have marked the Sundgau and all its surrounding regions, including Montbéliard in Franche-Comté, and Porrentruy and Basel in Switzerland. The founder of this branch, Louis IV of Mousson and Bar (who died in 1065) was a Romance-language-speaking noble, born in the castle of Mousson (now in ruins) on the hills of Pont-à-Mousson, between Nancy and Metz in Lorraine. Historians suppose that the emperor of the Holy Roman Empire gave him the strategic territory of the Burgundy Gate (Sundgau, Ajoie and Pays de Montbéliard) as a gift. The emperor’s intentions in doing so was to position a reliable man on the geographic gap in order to thwart the plans of his rival, the Duke of Burgundy. So, thanks to this imperial act Louis de Mousson added the Pays de Montbéliard and the Sundgau, which are situated on the most exposed points between the Germanic and Latin worlds, to his existing territories of Bar and Lorraine. On the death of Louis’ son, Thierry I, in 1125 his possessions were shared among his four sons. Frederic I thus became the first Count of Ferrette (1125-1160). He and his fellow counts of Bar and Montbéliard shared a common coat of arms, featuring two fish. 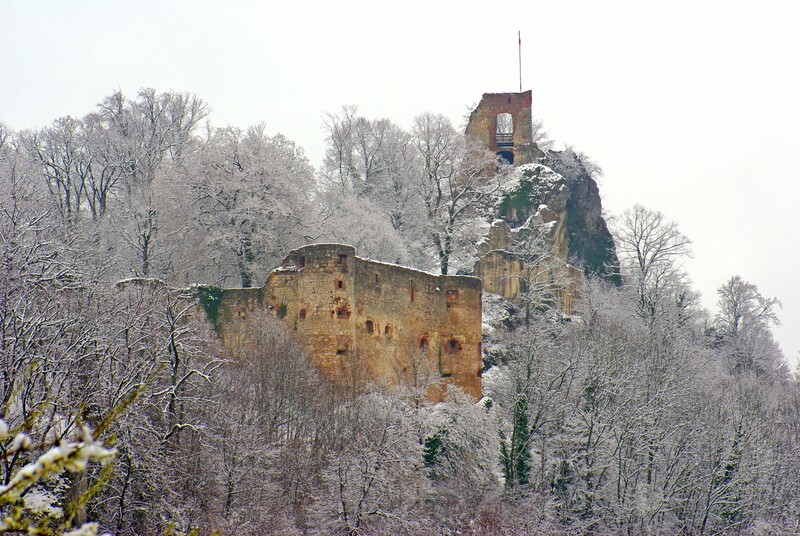 Thierry II, Count of Montbéliard, had a castle built at the top of a steep hill above the Savoureuse River. He named this castle “Belfort”. The territory of Frederic I, the Count of Ferrette, extended to the hill, facing Belfort castle. So he in turn decided to erect his own castle which he named “Montfort”, on the current site of the “Tour de la Miotte” (Miotte Tower). From this point onwards the two related families shared a long common history of both happy events and conflicts of interest. In examining the life of Frederic II, Count of Ferrette (1197-1232), there are obvious parallels between this unscrupulous, violent and arrogant man and the cruel customs and mysterious intrigues of the Middle Ages. Of all the Counts of Ferrette throughout the ages, Frederic II’s government was by far the most troubled, with the Count never ceasing to wage war against his neighbour Richard de Montfaucon, Count of Montbéliard. A few days after having been scorned by his other rival, the Bishop of Basel, Frederic II was mysteriously assassinated in his Ferrette castle. Public rumour implicated his son, Louis the Fierce, as the agent of the crime, and as such he was immediately excommunicated by the Pope and banished, leaving the possession of the county to his brother Ulrich. But it was reported in the cold, dark halls of the castle that on Ulrich’s death he made a deathbed confession to having been the real perpetrator of the crime! If the counts of Ferrette possessed the majority of the Sundgau, the ‘Sundgauvian’ territories of the north-east had long since belonged to the Habsburg dynasty, a wealthy local family whose heritage also includes Swiss lands. Moreover, the Habsburgs had passed on the honorary title of Landgrave of Upper Alsace (Sundgau) from father to son for centuries. During the 14th century the Habsburgs and Ulrich III, the last Count of Ferrette, became very close. Seriously ill and realising that he would not have a male heir; Ulrich undertook several difficult measures in order to save his county from the Bishop of Basel and his ambitions. A master strategist, Ulrich III was anxious for his daughter, Jeanne de Ferrette, to inherit his county. During the Middle Ages only the Pope had the power to arbitrate exceptionally in his favour. Against all hope, Ulrich received the precious papal consent in 1320. His county would become a powerful bastion of Austrian lands. His daughter Jeanne de Ferrette, a direct descendant of Charlemagne, would enable the dynasty of the Habsburgs, future masters of Europe, to continue. Thanks to her, the Habsburgs could claim to be blood descendants of Charlemagne. To seal the alliance, after Ulrich’s death Jeanne immediately married Albert II of Habsburg at Masevaux. By legitimate process the Sundgau became an entirely Austrian territory and remained so until 1648. However, according to documents of the time, this marriage of political interest seemed to quickly transform into one of love. Albert II and Jeanne de Ferrette settled in Vienna, from where their offspring would later extend their possessions into central and Eastern Europe. The Sundgau quickly became a Habsburg bastion: a base for the dynasty which would later seek to conquer Europe and the rest of the world. The Sundgauvians’ deep loyalty towards the House of Austria, which they considered to be born of their country. The establishment of the capital of Anterior Austria (Vorderösterreich) in Ensisheim in Upper Alsace. Anterior Austria included the Habsburgs’ personal possessions, from the Vosges to the Arlberg Pass to Tyrol, passing by the land of Baden and northern Switzerland. In becoming entirely Austrian, the Sundgauvians were not safe from the desires of Austria’s powerful enemies: the influential duchy of Burgundy, the fierce Swiss Confederates and the distant kingdom of France. The frequent passing of enemy armies due to the Sundgau’s strategic position between the North and Mediterranean Seas, and between the two rivals, Paris and Vienna, did it more harm than good. Later, in the 16th century, the Sundgau found itself surrounded by powerful Protestant cities: Mulhouse to the north, Basel to the east and Montbéliard to the west. The Habsburgs took a very firm stance against all attempts to introduce the Reformation in the Sundgau. Subsequently, the dynasty was the spearhead of the Counter Reformation, encouraging the introduction of anti-reformist works (particularly monasteries and Jewish schools) in the Sundgau. However, from the Peace of Augsburg in 1555, Protestantism continued to make progress in Europe. The Protestant princes of Bohemia refused to recognise the authority of the emperor of the Holy Roman Empire (HRE), Ferdinand II (who himself was a Habsburg). It was further complicated by the intervention by France, which had long been hostile to the ambitions of the House of Austria in Europe. During the Thirty Years’ War (1618-1648), Belfort was coveted by each side and was thus considered a sort of Gibraltar of the East. But King Louis XIV of France’s victories forced the Habsburgs to surrender Upper Alsace to him. The Habsburgs withdrew from the other side of the Rhine and made Freiburg-im-Breisgau the new capital of the rest of their possessions in Anterior Austria. On the 24th October 1648 the Habsburgs signed the Treaty of Westphalia, stipulating the transfer of the Sundgau to France. However, public protests against the new French authority in the Sundgau were felt until the Treaty of Rijswijk (1697) and, it seems, until the beginning of the 18th century. From 1648 the Sundgau was ruled by France and remained under its national colours until 1871, despite the Austrian desire to win back the Sundgau. By the Westphalia Treaty, the Sundgau was snatched from Anterior Austria, causing it to lose much of its strategic value. Nevertheless, the Habsburgs continued to hang onto the Rhine since they still, with difficulty, held the key town of Breisach, the “Gate to Germany”. During the French Revolution (1789), Alsace and the Sundgau were administratively reorganised. From December 1789 to February 1790, the Constituante completely reorganised the French administration. The former provinces (Lorraine, Normandy, Alsace, Burgundy, Provence, etc) gave way to départements, which were themselves divided into several districts (or arrondissements). The province of Alsace was thus divided into two départements: the Bas-Rhin to the north and the Haut-Rhin to the south, with their respective administrative centres of Strasbourg and Colmar. Belfort, Mulhouse and Altkirch became the three sub-prefectures of the Haut-Rhin. In 1806, in the Napoleonic period, the rest of Anterior Austria still under the direct power of the Habsburgs was shared between the duchy of Bade and Switzerland. From then on, Vienna became the epicentre of an empire which was more and more turned towards Eastern Europe: the romantic banks of the Rhine were eclipsed by those of the beautiful blue Danube. 1871 was a year that would go down in the Sundgau’s history, as it symbolises the defeat of the French army by the Prussian army. In 1870, Belfort sustained a memorable siege for 103 days, personified and symbolised by the statue of the Lion erected in 1880 by Bartholdi (a native of Colmar renowned for having designed the Statue of Liberty in New York). Thiers and Bismarck had difficulty negotiating the drawing up of the Frankfurt Treaty. Letting the heroic city of Belfort become Prussian hurt the French patriotism of many Republicans. The Prussian state officers were pleased with France’s proposition of exchanging twelve iron-rich Lorraine villages for Belfort and sixty villages of the Haut-Rhin. As soon as it was announced, the idea was accepted by the Prussians and confirmed by the French National Assembly. Metz and the département of Moselle were thus given to the Prussians, in exchange for Belfort and its Alsatian district. The detached part of the Haut-Rhin which remained French was not immediately called “Belfort Territory”, but rather “French District of the Haut-Rhin”. It was only in 1922 that the Belfort Territory – “the temporary entity waiting for the return of the Haut-Rhin to France” – became an official département as such. Despite the Haut-Rhin being returned to republican France in 1918, the French authorities were not keen to have the territory returned to the department as the Constituante of 1789 had initially organised. From that point onwards, Belfort and its territory were no longer considered ‘Sundgauvian’. In this way, at the start of the 20th century the Sundgau was confined to the present district of Altkirch. At the celebration of Austria’s one thousandth anniversary in 1996, Anterior Austria returned to a place of honour. A business of European dimensions was put in place (with the creation of tourist brochures and books, exhibitions, European trades, and popular and cultural festivals) and mobilised the European Union, the Alsace region, Baden-Wurtemberg, Alemanic Switzerland, and of course all of Austria. The recognisable traits of the Habsburgs (the Austrian flag and the two-headed eagle) were henceforth visible in all of Anterior Austria and seem to be the silent witnesses of the common history of these regions… at the very least they remind us, rather curiously, that before being French or German, the Sundgau was completely Austrian! The flag of the Sundgau is an unofficial design that emerged recently in the local landscape, maybe as an initiative to reinforce a sense of unity and belonging. It does not appear on public buildings (such as town-halls, schools, local councils) alongside the European, French and Alsatian flags. In Altkirch, you can see it as an iron sign of the Sundgau museum and in the neighbouring village of Carspach, featured in the centre of … the village’s roundabout! 1. The 3 stars from Cardinal Mazarin’s coat of arms. The Sundgau was given by Louis XIV to Mazarin in the 17th century to thank him for his loyal service. 2. The Austrian flag (red-white-red). The Sundgau was Austrian from 1324 to 1648 whilst some of its territory already belonged to the Habsburg dynasty as early as the 11th century. 3. The 2 fish from the Counts of Ferrette. The Counts of Ferrette’s coat of arms featured 2 golden fish, curiously 2 seabass. The seabass is an ocean-going fish which was admired in medieval times for its strength: the fish could grow to a total length of over 1 metre and 15 kg in weight. The 2 fish originated from the Lorraine ancestors of the Counts of Ferrette and Montbéliard. This explains why some areas and cities in Lorraine (Barrois area, Pont-à-Mousson, Longwy) also feature the fish in their local flags.